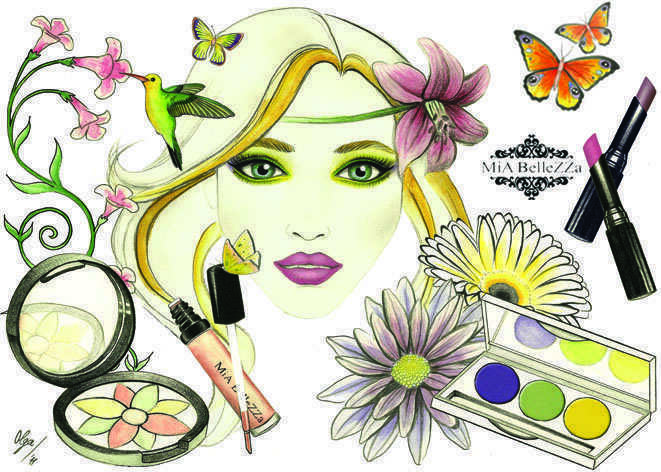 Earlier this year I was approached by MiA BelleZZa Cosmetics, a unique Mineral Cosmetics Company founded by Rita Patel, to create the new MiA BelleZZa Spring / Summer Collection Campaign Ad. I received the MiA BelleZZa Pro Artist Palette soon after and had a chance to try a variety of their products. 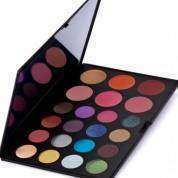 The Pro Artist Palette has 16 Mineral Pressed & Multidimensional Eye Shadows, 4 Blush Colors and 2 Lip Rouge shades. The variety of colors is so well assembled that I actually didn’t know with which one I wanted to start. The Pro Artist Palette has got all the basics covered; right from the essential matte colors (that I always recommend) to warm tones ranging from gold, peach, pink, velvet and green to cooler tones of silver, blues, purples and grey. It also has a lovely variety of warm Blush and Lip Rogue colors. The eyeshadows come in Matte form, Shimmery and Frosted. Trying out each color they all apply smoothly without exception and had a great color intensity. These shadows can also be applied both dry or wet, transforming them into liners. 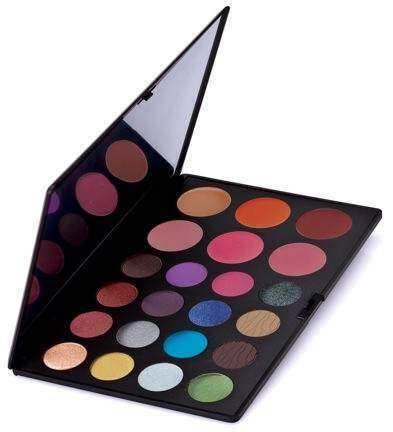 Apart from the variety of colors, what makes this palette a great addition to any Makeup Kit, whether professional or personal usage is that these eyeshadows consist of a none-drying formula, they are Hypoallergenic, Crease Resistant and Mineral oil free. Containing Vitamins C & E that condition and protect the eyelids. The Lip Rogue shades are fortified with exclusive Collagen Tripeptide Complex, an anti-aging powerhouse that stimulates collagen production to help reduce visible signs of aging. With Color Wear Complex, a patent pending technology that helps suspend pigments to create a soft cushion, comfort and long-lasting wear. Instantly re-hydrates lips for a plumper, smoother, fuller appearance. Like the Mineral Eyeshadows, The Lip Rogue is also Hypoallergenic, fragrance-free, Oil free, Dye free and contain ingredients with powerful antioxidant vitamins A, C & E.
– Mineral Makeup allows the skin to breathe and does not contain any preservatives that cause pores to clog. – Mineral Makeup foundation lasts longer on skin than traditional makeup as it continues to absorb moisture all day long. 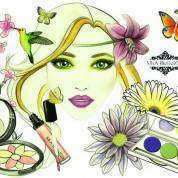 – Natural color pigments in mineral cosmetics are much more intense, resulting in less product usage for an application. – Mineral makeup does not contain any moisture, therefore bacteria does not form. Some of the MiA BelleZZa products that do have a shorter shelf life, have expiration dates printed on the packaging. Usually 12 months.